We’ve seen los latinos en Miami-Dade and, after tapping into a slightly different US Census Bureau data, I added the population of brasileiros to the list. There are, of course, many more ethno-national-geographic groups comprising the colorful population of the county, and I’ll be sure to get to those in due time. Today, however, I wanted to look at at the distribution of those members of our community who were “made” (that is, born) in China, or 中国制造 (zhōng guó zhì zào). 中 国 制 造 (Made in China). Data Source: 2012 American Community Survey, 5-yr Estimate. Map Source: Matthew Toro. 2014. 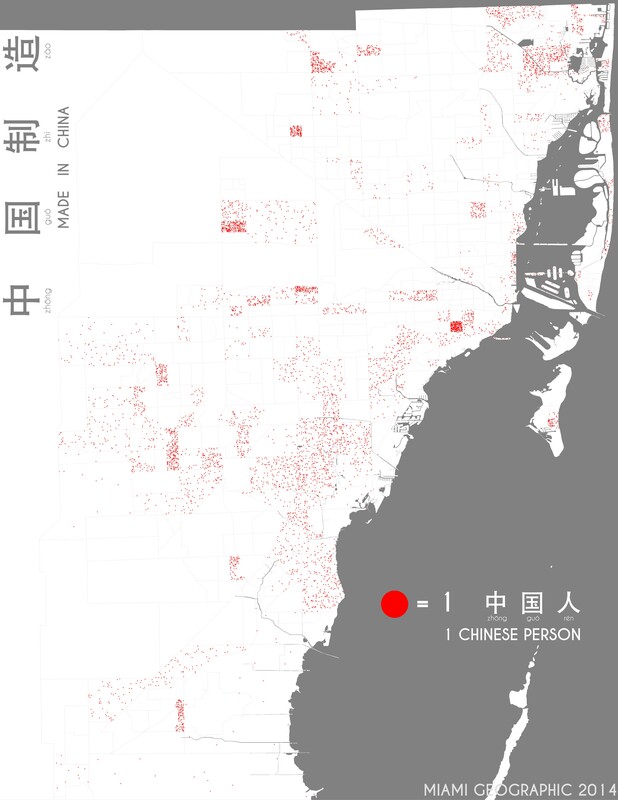 Each dot on this map represents one Chinese person, or one 中国人 (zhōng guó rén). As with the map of Brazilians, data came from the 2012 American Community Survey 5-yr estimate (the one least prone to estimation error), specifically the “Foreign Born” dataset. The population of Miamians born in China is relatively thin, but there are some faint pockets here and there. Notable is that relatively dense cluster of Chinese in the City of Miami’s historic Shanandoah neighborhood, as well as the City of North Miami Beach and Aventura areas. Chinese seem to have settled in the far western municipalities of Doral and Miami Lakes area north of Hialeah in the northwest of the county too. A good sprinkling of Chinese Miamians can be found all throughout the county, including fair distributions in Pinecrest, Coral Gables, and in east Kendall, the latter of which remains an unincorporated part of town. One can’t forget the Hammocks and surrounding neighborhoods of west Kendall. It’s likely that the Chinese-American population will continue to grow as Miami’s role in facilitating Sino-American and, perhaps more significantly, Sino-Latin American trade and finance expands. Our public and private institutions of higher learning — e.g., Florida International University and the University of Miami — also continue to attract talented Chinese youth wishing to study and pursue their careers in the United States, creating yet more opportunities for Miami’s Chinese population to rise.